Coperion K-Tron is represented by more than 80 sales organizations with over 100 offices in 60 countries around the world. Selecting the right feeding or conveying equipment depends on material handling characteristics, required accuracy, rate of material throughput, data communication needs and physical constraints such as plant headroom and the processing environment. K-Tron`s modern material test lab facilities in New Jersey, Kansas, Switzerland and China are available to help you make the optimal equipment selection. The Coperion K-Tron Institute provides hands-on startup, operator and maintenance training for all supplied equipment specific to your application. Training can be conducted in Coperion K-Tron classroom facilities conveniently located around the world or may be arranged on site. Coperion K-Tron maintains a worldwide network of factory trained service engineers and central parts supply centers to provide on-site solutions to keep your process up and running and minimize costly downtime. 24/7/365 technical assistance is also available to help solve customer problems. 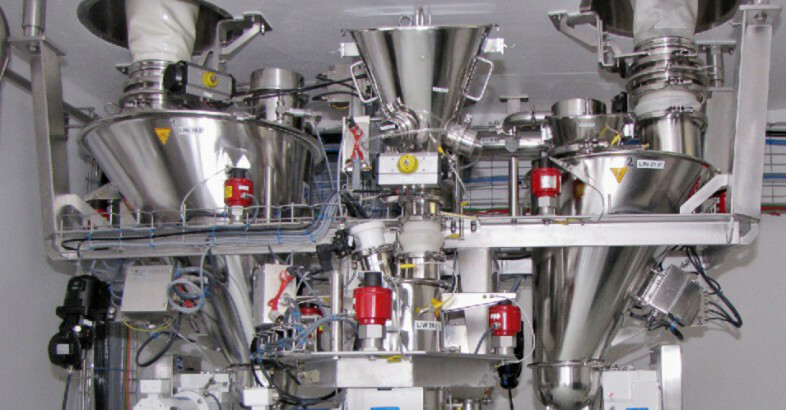 Coperion K-Tron feeders provide high-accuracy feeding solutions to handle a wide range of ingredients – from chocolate chips to fiberglass and from floodable powders to waxy liquids. The Coperion K-Tron product line includes volumetric feeders, loss-in-weight feeders, weigh belt feeders and mass flowmeters for bulk solids and related controls for continuous or batch processes. 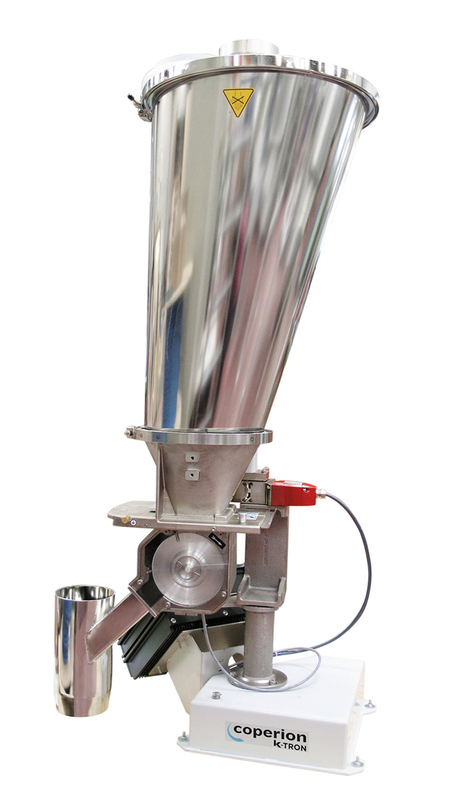 These feeders are used in the plastics, chemical, detergent, food, pharmaceutical and other industries. 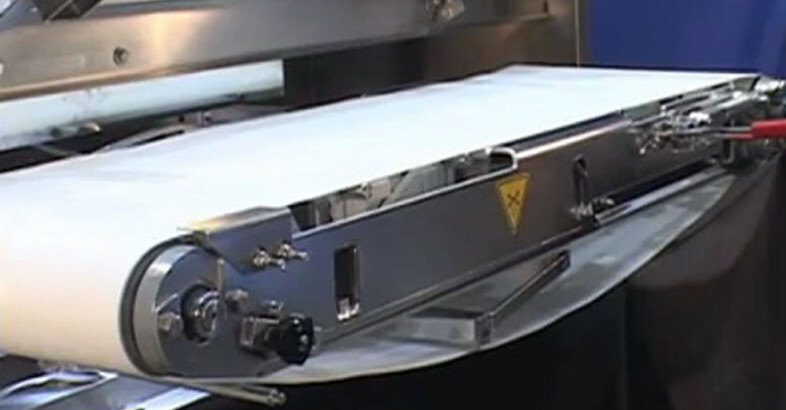 In principle, volumetric feeding is the simplest, most economical feeding solution available. Bulk material is held in a hopper and constantly fed into a process per unit of time. 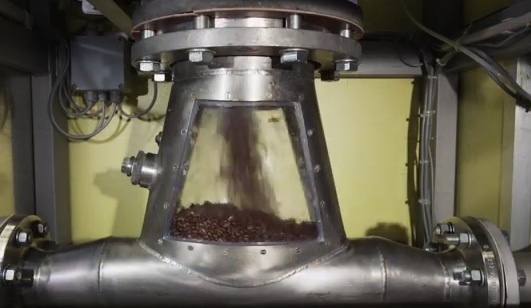 A gravimetric feed rate may be inferred through a calibration process where a timed sample is taken and weighed, and screw speed adjusted accordingly. Although there is no weight feedback to assure feeding accuracy over time, this may not be a concern for materials with consistent bulk density. 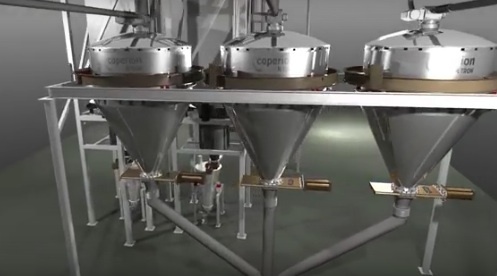 Coperion K-Tron offers a wide variety of single and twin screw volumetric feeders. With exchangeable screw design choices, you can handle a wide range of applications involving prefeeding, feeding or batching of materials with consistent density, particle size and moisture content. Volumetric models of Bulk Solid Pump ( BSP ) Feeders are an economic choice offering excellent accuracy. handle free-flowing materials such as pellets and powders. Twin Screw Feeders handle more difficult materials such as pigments, sticky, bridging or flooding powders, fibers and fiberglass. 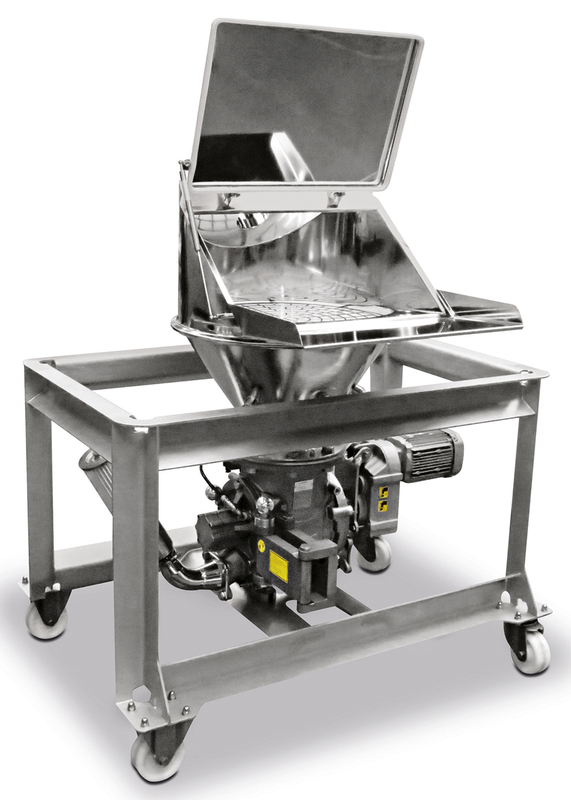 Coperion K-Tron Gain-in-Weight Batching Stations provide flexible and economical batch prep for applications up to eight components and 100 recipe lines. 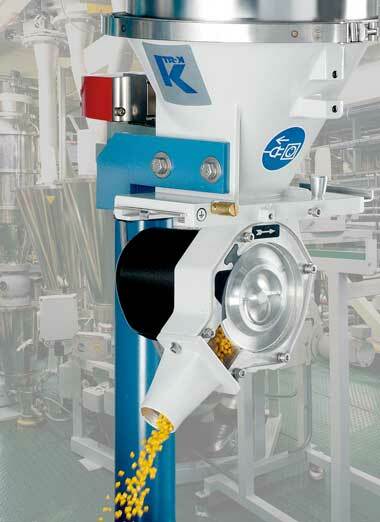 Coperion K-Tron pneumatic equipment offers both self-contained and central vacuum conveying solutions. The P-Series receivers offer sanitary design for either dilute or dense phase vacuum conveying applications and can handle powders and other difficult materials at rates up to 4000 kg/hr (8800 lb/hr). 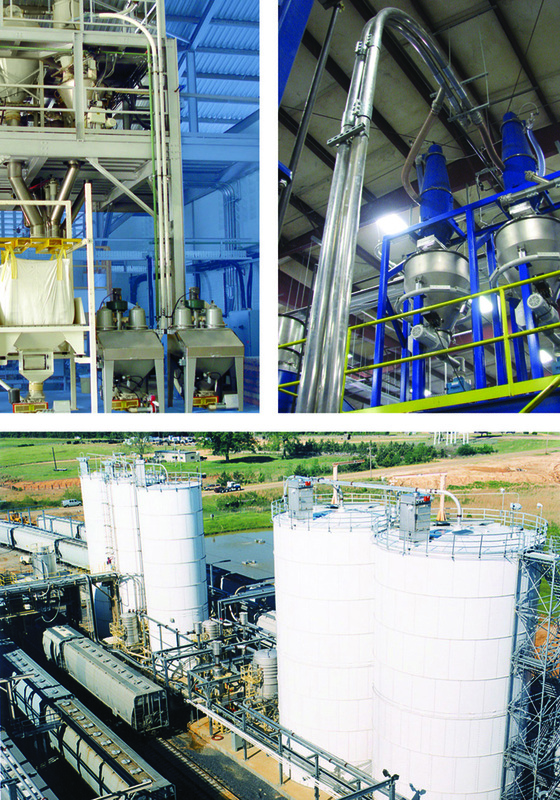 Applications include simple `up and in` systems to custom central conveying projects. The Coperion K-Tron pneumatic equipment includes Aerolock® rotary valve, Series II 2400 vacuum receiver, blower package and diverter valve product lines as well as engineered systems for rail car and truck unloading, as well as for its storage-to-production-line transfer systems which are used in the plastics, compounding, food and chemical industries. Processors can receive a complete material handling system, engineered by Coperion K-Tron`s systems engineering group– one source for all of you material handling needs. Coperion K-Tron ist ein führendes, weltweit operierendes Unternehmen im Bereich hochqualitativer Dosierer und pneumatischer Fördersysteme/-komponenten sowie Systeme und Dienstleistungen. Coperion K-Tron ist Branchenexperte bei der Gestaltung von Systemen für schwer zu handhabende Materialien. Spezialisiert auf hoch genaue Dosierung von Pulvern und Schüttgütern, entwickelt, produziert und betreut K-Tron jeden Aspekt der Produkte und sorgt so für grösste Genauigkeit, Kontinuität und langfristigen Nutzen. Coperion K-Tron besitzt über 100 Patente für Dosier-, Wäge- und Regeltechnologien sowie mechanische Technologien und deren Anwendung bei der Handhabung von Schüttgütern. Coperion K-Tron ist mit 80 Verkaufsorganisationen in über 60 Ländern auf der ganzen Welt vertreten. Die Wahl des richtigen Dosier- oder Fördersystems ist abhängig von verschiedenen Faktoren wie z.B. Fliesseigenschaften des Schüttgutes, Durchsatzleistung, gewünschte Genauigkeit, Bedienungskomfort und die Möglichkeit von Betriebsdatenerfassung. Ebenfalls beeinflussen bauliche Gegebenheiten sowie Schutzart der Prozessumgebung die Wahl des Dosiersystems. Coperion K-Tron verfügt über moderne Versuchslokale in der Schweiz, Grossbritanien und Amerika , welche dem Kunde für Materialversuche gratis zur Verfügung stehen, um die optimale Dosierlösung zu finden. Das Coperion K-Tron Institute bietet praktische Schulungskurse für Inbetriebnahme, Bedienung und Wartung von den Coperion K-Tron Geräten in Ihrem Prozess an. Mehrere Schulungslokale stehen weltweit zur Verfügung. Auf Wunsch können auch Kurse vor Ort beim Kunden stattfinden. Coperion K-Tron verfügt über ein weltweites Netz von gut ausgebildeten Servicetechnikern und zentrale Ersatzteildepots für rasche und effiziente Lösungen, um teure Stillstandszeiten zu verhindern. Für dringende Probleme bietet eine Hotline technische Unterstützung 24 Stunden im Tag. Coperion K-Tron Great Britain Ltd.
Coperion K-Tron (Shanghai) Co. Ltd.